This is another recipe is from Epicurious. It is terrific for spring. I’ve modified the recipe a little bit, but kept the primary components. I like to do steak in a pan the Tom Colicchio-way, basting the meat in butter as it cooks. Factor in about one steak per person. I prefer my radishes crunchy, so I wouldn’t recommend letting them sit in the dressing for as long as the original recipe states. I love fava beans. Get them fresh while you can (now is the season). They are extremely labor intensive to shuck and peel, but it is worth it. Here is a handy video clip to show you how if you have never cooked with fava beans before. Just ignore the cooking times that the cook in the clip recommends. I never really measure out my oil or vinegar for the vinaigrette . . . If pressed, I would suggest that 3:1 ratio of oil to vinegar. 1. In a medium bowl, whisk together the vinegar, oil, and mustard until they form an emulsion. Adjust the seasoning to your taste. If using fresh favas, you will first need to shuck the beans from the pods. Discard the empty pods, and blanch the beans in boiling water for about 2 minutes — any longer than that, and they will be mushy. Have an ice bath ready to shock the beans. By submerging the beans in ice water after draining them, you will retain their beautiful green color. When the beans are cool, you will need to remove the waxy outer-covering of each one. If you nick the end of a bean with your finger nail, you can easily squeeze the bean out of its peel. 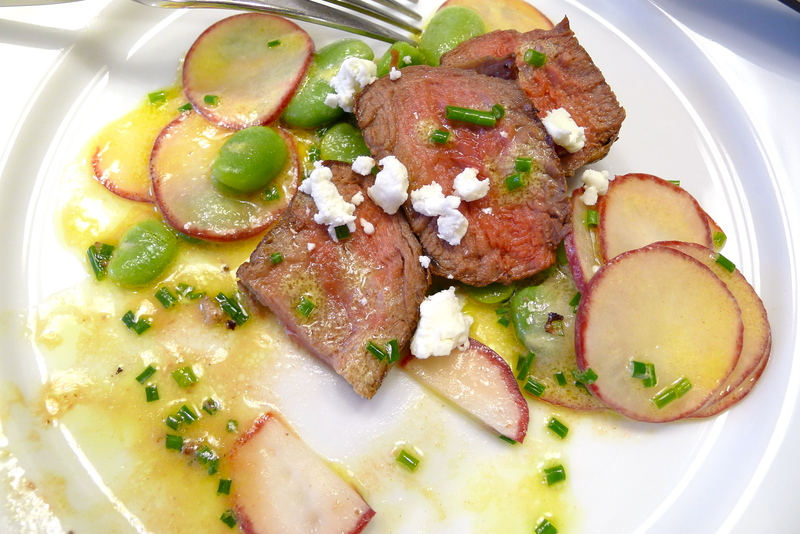 Toss the fava beans and the radishes in the vinaigrette. You want them evenly-coated with the dressing. 2. Pat the steaks dry with paper towels, and season them liberally with kosher salt and pepper. In a heavy pan, heat the canola oil over high heat until it is almost smoking. You’ll be able to see when the oil is up to temperature when its surface begins to shimmer. Sear the meat on both sides, about 2 minutes per side. Reduce the heat to medium-low. You must reduce the heat to prevent the butter from burning on contact with the pan. Add a good knob of butter to the pan. Tilt the pan and, using a spoon, baste the steaks continually with the melted butter and oil mixture, flipping them halfway through cooking. Continue to cook the steaks until you have achieved your desired level of doneness. Transfer the steaks to a cutting board. Let them rest a few minutes before slicing them. Bear in mind that the steaks will continue to cook a little bit while resting, so you may want to keep this in mind and remove them from the pan when they are a little bit rarer than how you want to eat them. 3. Toss the fava beans and the radishes with the chives. Divide the fava bean and radish mixture between two plates. Top each portion with one of the sliced filet mignons. Drizzle some of the vinaigrette, and sprinkle on some of the crumbled chèvre over each steak. Serve immediately.